I am not a blogger. But I apparently will be shortly as I try to attempt to do what my wife does so well. What I am good at is barbecue. And apparently when you combine a spouse who writes professionally and incorporates our combined passion for barbecue you get… samples? Yes, I recall the first time Mary received her first sample bottle of wine, the excitement, the giddiness that came from the acknowledgement that someone out there was paying attention to this one voice of many on the web. Boy did I learn a thing or two. 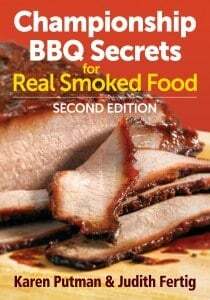 Championship BBQ Secrets for Real Smoked Foods, by Karen Putman and Judith Fertig, is a (very) comprehensive summary of not only BBQ techniques, but also of so many variations on sauces, sides, pork, beef and specialty meats that it can almost overwhelm anyone when you first open it. While lacking in photo quantity, which (in my humble opinion) is so important for a cookbook for the masses, it makes up for it in the volume of pork and beef options. Imagine waking up one day saying, I want to try seven different ways to make brisket; well this book is for you. Let’s break it down by major category before the final verdict. You have lots of them in this book, from rubs, to pastes, to beef and lamb to several other meats in between; this book takes a look at your appetite and definitely has a lot to offer. The technique section is good, though not Myron Mixon good (and if you follow bbq, you know who he is). Sometimes when I experience so much variation it can be overwhelming. The choices combined with lack of photos, which as I mentioned were lacking. Plus, why not break out the options into different books? Hear me out… when you go for something so comprehensive, I tend to get a little questionable whether they truly can nail every single recipe. From my attempt at a small sample, some were perfect, others needed tweaking. Side Dish: Smoked Deviled Eggs – The verdict, a winner for the concept but the portions of the deviling seemed off, I went back and adjusted back on some of the ingredients for a richer texture. Rub: Flower of the Flames Rib Rub – The verdict, ok. For something that says “flame”, I expected more heat, but the flavor was there. Sauce: Flower of the Flame Raspberry BBQ Sauce – The verdict, too sweet, but there was flavor. My goal with anything sweet is to balance with heat and this one didn’t balance the heat. Poultry: Cornish Game Hen – The verdict, not so much. I didn’t get the crackling exterior and the honey glaze wasn’t working for me. Pork: World Championship Ribs – The verdict, a winner. Even with the flower of the flame rub and raspberry sauce, the flavor was there. 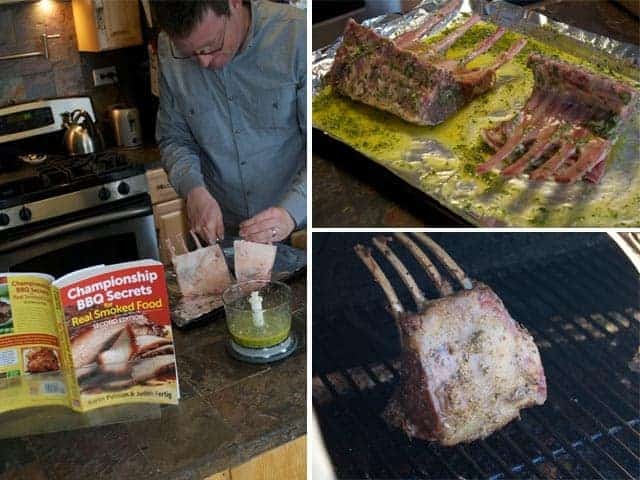 Lamb: Cherry Smoked Rack of Lamb with Fresh Herb Paste – The verdict, a winner and our favorite of all the recipes we tried from the book. I haven’t smoked lamb before and this turned out great, especially with the addition of the paste. We’ve also included this very recipe below! 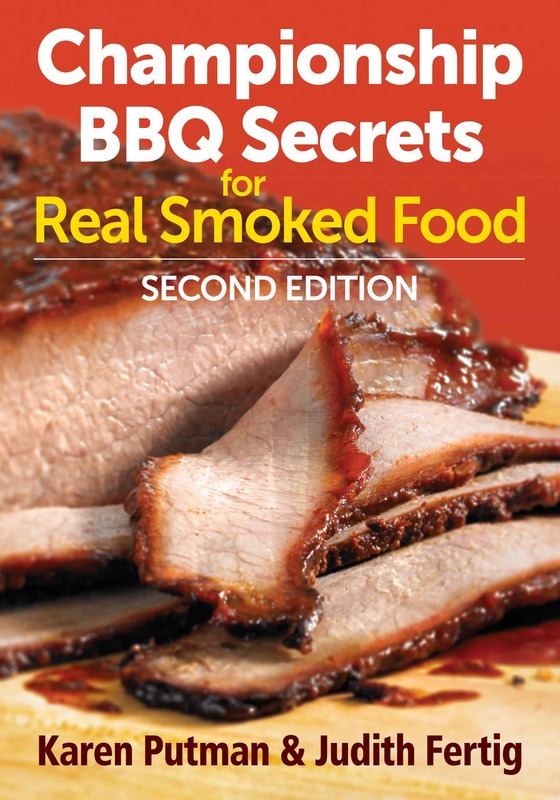 If you are experienced on the BBQ looking to branch out for options, yes this book is for you. If you are a novice, I say stick with books focusing on technique and why it’s important to brine, inject, rub, mop and glaze your meats. This book has a lot of options for following along, but I really love the books that teach why so you can experiment on your own. So what else did I learn? A lot goes into writing a blog post and even more respect for the time taken for any serious blogger to stay focused. It’s a lot of work! So next time I see boxes that may be something other than wine, I think I might just keep my mouth shut. Excerpted from Championship BBQ Secrets for Real Smoked Food by Karen Putman & Judith Fertig, page 346, © 2013 www.robertrose.ca, Reprinted with permission. 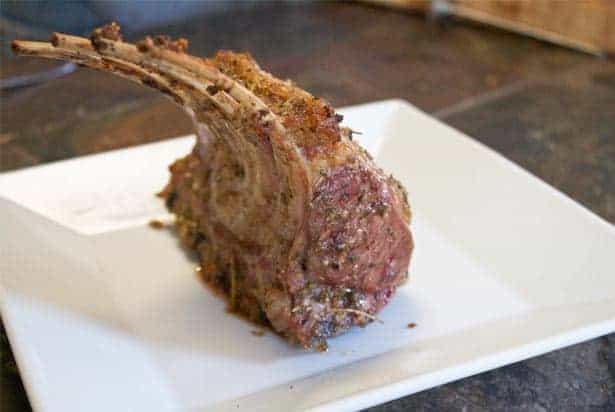 This recipe took first place in its category at the Kansas State Fair barbecue contest and helped me win the Kansas State Grand Championship at the National Lamb-BQ Contest. TIP: “French” the bones by scraping the bits of fat and flesh off the ends with a sharp knife (or have the butcher do this). Prepare the paste: In a food processor, process oil, thyme, basil, mint, seasoned salt, rosemary, garlic and shallots for 1 minute, or until mixture becomes a loose paste. Place lamb in a large sealable plastic bag and pour in paste. Seal bag, toss to coat and refrigerate for 2 hours. Remove lamb from paste and pat dry. Discard paste. In a small bowl, combine mustard and honey; brush onto lamb. Set aside. Place lamb directly on the smoker rack, add wood to the coals and close the lid. Smoke at 225ºF to 250ºF (110ºC to 120ºC) for about 11⁄2 hours, or until a meat thermometer inserted in the center of a rack reaches an internal temperature of 145ºF (63ºC) for medium-rare, or until desired doneness. That lamb looks so good! We will have to try that in our household. I enjoy the excellent guest blog post, “Hubby”!! You did good! The “Flower” of the Flames was Karen Putman. The first Female Executive Chef in the United Stars if my memory serves me correctly.